You may have noticed I didn't provide any measurements for the ingredients. That's because we are not really mixing anything. All the ingredients are applied as external seasoning and applied to taste with the exception of the marinade and injection. Clean and rinse the chicken breasts. Using a sterile injection needle, pierce the breasts on roughly 6 locations at an angle and inject Diet Cherry Dr. Pepper. As you inject you will fell pressure. Slowly withdraw the syringe while injecting so you inject evenly thru ought the meat. 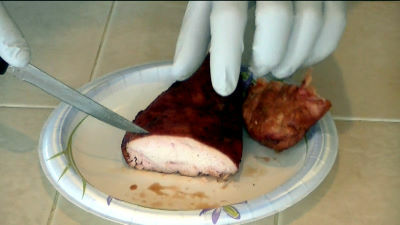 Once injected, place the chicken breasts in a 1 gallon Ziploc bag and fill half way up with Diet Cherry Dr. Pepper. This will be the marinade. Soak the chicken for 2 hours in the refrigerator. After the chicken has soaked remove it from the bag but don't rinse it off. Lay it on a cookie sheet and apply the Jack's Old South Hickory dry rub. Give it a good dusting. Lightly dust it with garlic powder. 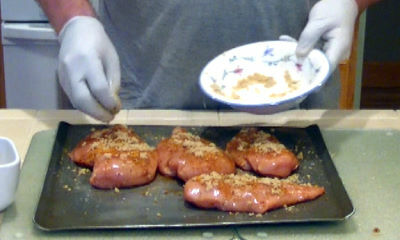 Apply a nice dusting of brown sugar and rub it all into the chicken breasts. Make sure to coat top and bottoms. Once you have seasoned the chicken put it on the smoker @ 230 degrees. Traeger owners, start on smoke or 180 degrees for 1 hour the go to 230 degrees. This will get more smoke into the chicken. Mist the every 40 minutes with Cherry Dr. Pepper to help keep the exterior moist as possible. When the internal temperature of the chicken breasts reaches 173 degrees, pull the chicken from the smoker. Let stand 20 minutes covered with foil and serve. As always this would go great with smoked beans and cornbread with honey baked in.